I’ve been wanting to make these lemon tarts ever since I bought the first Baked cookbook, Baked: New Frontiers in Baking, back in 2008. The tarts were featured on the cover of that book, and they looked, well, they looked *amazing*! I immediately bought some tartlet pans on Ebay in preparation, but, somehow, I never got around to making these lovely tarts until recently. I have to say, I was quite pleased with how they turned out. 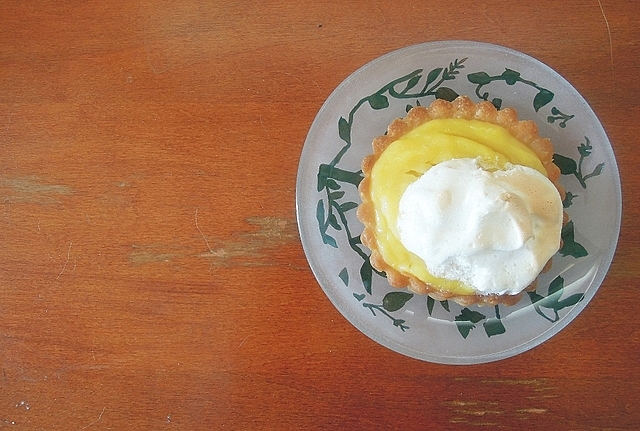 These little tarts are definitely a feast for the eyes, like tiny dishes of sunshine and a perfect dessert for summer! If I made them again, though, I’d make one little change. The tarts seemed a teeny, tiny bit, uhhh…tart, to me, although others told me that they were perfect. I tend to be my own worst critic, so I’m not sure if I would have noticed it if someone else had been doing the baking. It could have been my imagination. I would probably try using Meyer lemons in the future, though, which are a little less tart than regular lemons. Other than that, these were a delightful change from my usual baking repertoire. Quite fun to make…and eat! You can find the complete Lemon-Almond Meringue Tarts recipe after the jump. In a small bowl, whisk together flour, almonds, and ground cookies; set aside. Place butter in the bowl of an electric mixer. Sprinkle over confectioners' sugar and toss, using your hands, until butter is fully coated. Attach bowl to mixer fitted with paddle attachment and beat on medium speed until butter and sugar are well combined. Scrape down sides of bowl, add egg yolk, and continue beating until combined. Reduce speed to medium-low and slowly add the flour mixture; beat until well combined. Scrape down sides of bowl and add heavy cream and amaretto; beat until well combined. Form dough into a large ball using your hands. Wrap with plastic wrap and refrigerate 3 hours. Lightly flour a work surface. Turn dough out onto floured work surface and cut into 8 pieces. Gently knead each piece of dough into a smooth disc, using a spatula to turn dough, as it will be sticky. Add more flour to work surface if necessary. Cover each piece with plastic wrap and refrigerate dough until chilled, about 10 minutes. Using a rolling pin, roll each piece of dough into a 6-inch round, about 1/8-inch thick. Transfer each round to a 4-inch tart pan with a removable bottom and gently press into tart pan. Roll a rolling pin over each tart shell, pressing lightly to trim any excess dough; discard. Place tart pans on a baking sheet and gently prick the bottom of each tart pan with a fork; transfer baking sheet to refrigerator and chill 30 minutes. Meanwhile, preheat oven to 375 degrees. Transfer baking sheet to oven and bake tart shells until golden brown, about 20 minutes, rotating baking sheet halfway through baking. Remove from oven and let cook completely. Place lemon juice and zest in a small bowl to soften zest, about 10 minutes. Meanwhile, in a nonreactive heatproof bowl, whisk together eggs, egg yolks, and sugar until well combined. Add lemon juice and zest and continue whisking until just combined. Set bowl over (but not touching) simmering water. Continuously stir mixture with a heatproof spatula until mixture has thickened to a pudding-like texture, about 6 minutes. Remove bowl from heat and whisk in butter until melted. Strain mixture through a fine sieve into a large bowl (Note from Erin: I skipped the straining. Lemon curd was fine.) Cover lemon curd with a sheet of plastic wrap, pressing plastic wrap onto the surface of the lemon curd to prevent a skin from forming. Set aside at room temperature while you make the meringue. In the bowl of an electric mixer fitted with the whisk attachment, whisk together egg whites and sugar until combined. Return bowl to electric mixer and beat on high speed until thick, about 3 minutes. Add cream of tartar and continue beating until stiff peaks form, about 3 minutes more. Add amaretto liqueur and beat until just combined. Remove tart shells from tart pans and place on a parchment paper-lined baking sheet. 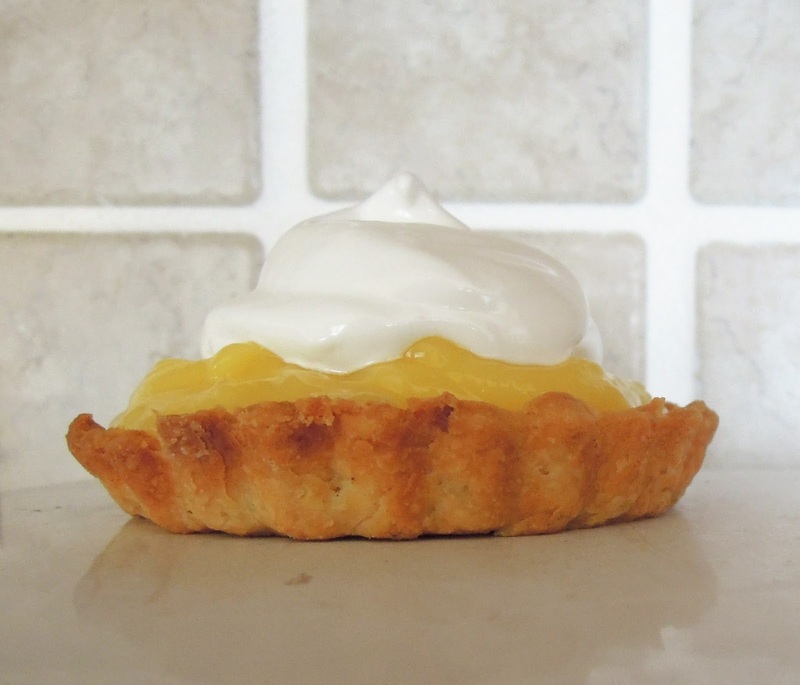 Divide lemon curd evenly between tart shells. Using a large ice cream scoop, scoop meringue and place on top of lemon curd, dividing equally. Spread meringue out toward the edges of each tart. Place tarts under broiler until meringue is just browned. Alternatively, use a kitchen torch to brown the tops of each tart. These are best when served within 24 hours. Note: This recipe makes a lot of meringue. To use up the remaining meringue, we made meringue cookie w/ chocolate chips. They look adorable! I'm with Grace, I just love individual serves :) And I'm so excited it's a Baked dessert, I'm a fan.